A North-east cook is looking forward to visiting Australia as she retires this week after nearly 30 years of service. Alison Finnie, 62, prepares to hang up her apron for the last time tomorrow at Auchnagatt School. Her free time has already been allocated for as she has arranged to jet off to Australia to spend some quality time with her son and three grandchildren for a couple of weeks. 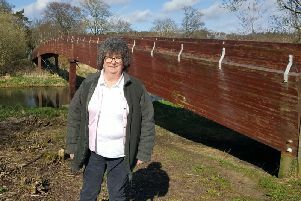 For 29 years she has worked for Aberdeenshire/Grampian council and spent the last 9 years at Auchnagatt school kitchen. She told the Times: “I worked at Auchterellon for 18 years before I came up here. On Monday pupils visited Santa in his grotto and the Parent Council gathered for tea and mince pies before a raffle was drawn. Chairperson Kirsty Davidson presented Alison with a surprise card thanking her on behalf of the school for the delicious meals served up over the years and wished her well. Some of her signature dishes at the school included tomato and lentil soup, macaroni and her chicken pie.